Let the collections at Rijksmuseum and Anne Frank House capture your imagination. Satisfy your inner culture vulture at Van Gogh Museum and Leidseplein. There's much more to do: admire the masterpieces at Museum Het Rembrandthuis (Rembrandt House), view the masterpieces at Boekie Woekie, take a stroll through The Jordaan, and hunt for treasures at Albert Cuyp Market. To find more things to do, maps, reviews, and more tourist information, you can read our Amsterdam holiday planner . New Delhi, India to Amsterdam is an approximately 10.5-hour flight. The time zone changes from India Standard Time to Central European Time, which is usually a -4 hour difference. Traveling from New Delhi in June, expect Amsterdam to be much colder, temps between 23°C and 13°C. Wrap up your sightseeing on the 21st (Thu) early enough to travel to Lisbon. On the 22nd (Fri), take in the exciting artwork at Museu Calouste Gulbenkian, take a stroll through Belém Tower, then take a stroll through Chiado, and finally look for gifts at A Outra Face da Lua. Keep things going the next day: browse the eclectic array of goods at Feira da Ladra and then enjoy the sand and surf at Praia da ursa. For photos, maps, where to stay, and other tourist information, use the Lisbon travel tool . Traveling by flight from Amsterdam to Lisbon takes 6 hours. Alternatively, you can do a combination of train and flight; or drive. The time zone changes from Central European Time (CET) to Western European Time (WET), which is usually a -1 hour difference. Expect a bit warmer temperatures when traveling from Amsterdam in June; daily highs in Lisbon reach 32°C and lows reach 18°C. Wrap up your sightseeing on the 23rd (Sat) early enough to travel to Marseille. The 2013 European "Capital of Culture," Marseille is the largest port city on the breezy Mediterranean coast and the second largest city in France. Start off your visit on the 24th (Sun): see the interesting displays at Museum of European and Mediterranean Civilisations, then contemplate in the serene atmosphere at Basilique Notre-Dame de la Garde, and then take a stroll through The Panier. On the 25th (Mon), you'll have a packed day of sightseeing: enjoy the sand and surf at Plage du Capelan and then stroll through Plage Capelan. To see photos, reviews, more things to do, and more tourist information, go to the Marseille trip builder site . You can fly from Lisbon to Marseille in 5.5 hours. Alternatively, you can drive; or do a combination of bus and train. The time zone difference moving from Western European Time (WET) to Central European Time (CET) is 1 hour. In June, plan for daily highs up to 33°C, and evening lows to 20°C. Wrap up your sightseeing on the 25th (Mon) early enough to travel to Cap d'Ail. Kick off your visit on the 26th (Tue): kick back and relax at Paloma Beach, then steep yourself in history at Villa & Jardins Ephrussi de Rothschild, then take in the architecture and atmosphere at The Church of Èze, and finally stop by Deli'. Keep things going the next day: contemplate the long history of Villa Kerylos, then kick back and relax at Eden Plage Mala, then take in the architecture and atmosphere at Chapelle des Penitents Blancs, and finally appreciate the extensive heritage of Promenade Le Corbusier. For traveler tips, photos, reviews, and tourist information, refer to the Cap d'Ail planner . Explore your travel options from Marseille to Cap d'Ail with the Route module. Traveling from Marseille in June, you will find days in Cap d'Ail are slightly colder (28°C), and nights are about the same (21°C). 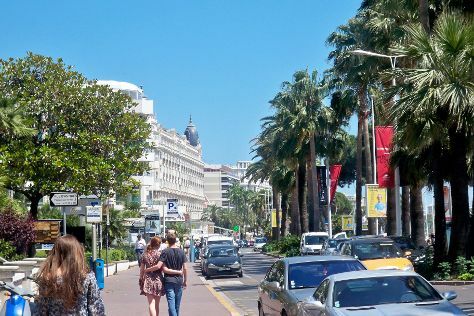 Wrap up your sightseeing on the 27th (Wed) early enough to travel to Nice. Start off your visit on the 28th (Thu): get a taste of the local shopping with La Croisette and then kick back and relax at Midi Plage. Get ready for a full day of sightseeing on the 29th (Fri): admire the masterpieces at Palais Lascaris, wander the streets of Vieille Ville, and then enjoy the sand and surf at Castel Plage. To find maps, more things to do, and tourist information, refer to the Nice trip itinerary planner . Explore your travel options from Cap d'Ail to Nice with the Route module. In June, plan for daily highs up to 28°C, and evening lows to 22°C. Finish your sightseeing early on the 29th (Fri) to allow enough time to travel to Sorrento. A lovely town easily accessible from almost anywhere in the country, Sorrento overlooks the Bay of Naples and sits right on the Amalfi Drive. On the 30th (Sat), don't miss a visit to Corso Italia, look for gifts at Emporio della Ceramica, view the masterpieces at Absolute Positano, look for gifts at Art & Craft Gallery, then stop by Nana' Positano, and finally tour the pleasant surroundings at Fornillo. Get ready for a full day of sightseeing on the next day: take in the spiritual surroundings of St Francis Church and Convent, admire the masterpieces at Correale di Terranova Museum, then contemplate the long history of Chiesa di Santa Maria Assunta e Cripta Medievale, then look for gifts at Theodora Moda Positano, and finally stop by Artigianato Rallo. For ratings, photos, where to stay, and more tourist information, refer to the Sorrento road trip app . Do a combination of flight and train from Nice to Sorrento in 5.5 hours. Alternatively, you can do a combination of train and flight; or drive. Expect somewhat warmer weather when traveling from Nice in June: highs in Sorrento hover around 32°C, while lows dip to 23°C. Wrap up your sightseeing on the 1st (Sun) to allow time to ride a ferry to Naples. Naples is the capital of the Italian region Campania and the third-largest municipality in Italy after Rome and Milan. On the 2nd (Mon), look for gifts at Cosmos-Artigianato Napoletano, wander the streets of Spaccanapoli, then stop by Fashion Victim Store, then pick up a one of a kind souvenir at Antichita e Restauro Lepre dal 1959, and finally see the interesting displays at National Archaeological Museum of Naples. Keep things going the next day: make a trip to Gli Scavi Archeologici di Pompei. To see reviews, maps, more things to do, and tourist information, go to the Naples trip app . Getting from Sorrento to Naples by ferry takes about an hour. Other options: drive; or take a subway. Expect a daytime high around 36°C in July, and nighttime lows around 24°C. Wrap up your sightseeing by early afternoon on the 3rd (Tue) to allow time for the train ride to Rome. Shop till you drop at Via Condotti and Officine Creative Roma. Get some cultural insight at Vatican Museums and Colosseum. And it doesn't end there: steep yourself in history at St. Peter's Basilica, take a stroll through Trastevere, don't miss a visit to Pantheon, and stroll through V Lounge Beach Club. To find reviews, traveler tips, where to stay, and other tourist information, read our Rome journey maker . Traveling by train from Naples to Rome takes 1.5 hours. Alternatively, you can drive; or take a bus. In July in Rome, expect temperatures between 37°C during the day and 24°C at night. You will have some time to spend on the 6th (Fri) before leaving for Florence. Kick off your visit on the 6th (Fri): contemplate in the serene atmosphere at Cathedral of Santa Maria del Fiore and then kick back and relax at Easy Living - Spiaggia sull'Arno. Keep things going the next day: stop by Jean Saade, see the interesting displays at Galleria dell'Accademia, shop like a local with Mercato Centrale, then stop by Davide Cerasi Leather Boutique, and finally look for gifts at Goccia Shoes. To find where to stay, maps, photos, and tourist information, read Florence travel route planner. You can take a train from Rome to Florence in 1.5 hours. Other options are to drive; or fly. Traveling from Rome in July, plan for a bit cooler nights in Florence, with lows around 21°C. Wrap up your sightseeing on the 8th (Sun) early enough to take a train to Venice. Start off your visit on the 8th (Sun): don't miss a visit to Dorsoduro, then steep yourself in history at Doge's Palace, then look for gifts at BrAgora, and finally take a stroll through Santa Croce. On the next day, wander the streets of Cannaregio, stop by Artigianato d'Arte di Vianello Mauro, and then look for gifts at Raggio Veneziano. To find maps, where to stay, reviews, and other tourist information, read Venice journey planner . Take a train from Florence to Venice in 2.5 hours. Alternatively, you can drive; or take a bus. In July, daytime highs in Venice are 36°C, while nighttime lows are 22°C. Finish your sightseeing early on the 9th (Mon) to allow enough time to travel to Argegno. Argegno is a comune (municipality) in the Province of Como in the Italian region Lombardy, located about 50km north of Milan and about 15km north of Como. Start off your visit on the 10th (Tue): kick back and relax at Spiaggia di Onno and then admire the natural beauty at Villa Carlotta. Here are some ideas for day two: look for gifts at Oleificio Vanini Osvaldo, stop by Gelateria Dulcis in Fundo, and then tour the pleasant surroundings at Spiaggia Tranquilla. Plan a trip to Argegno easily and quickly by telling Inspirock to suggest an itinerary. Explore your travel options from Venice to Argegno with the Route module. In July, daily temperatures in Argegno can reach 34°C, while at night they dip to 21°C. Wrap up your sightseeing on the 11th (Wed) early enough to travel to Como. Known for its idyllic location on the shores of Lake Como and at the foot of the Alps, Como is one of northern Italy's most popular tourist destinations. On the 12th (Thu), look for gifts at L'Isola Che Non C'e', then pick up some local products at Micromercato Moltrasio, then kick back and relax at Lido di Moltrasio, and finally stop by Rush Cycle by Rush Srls. On the next day, look for gifts at Cucinantica, look for gifts at Libreria Ubik, look for gifts at Tea World, then stop by Merceria Brumana Imac, and finally stop by Dep Design Store. To see ratings, other places to visit, traveler tips, and more tourist information, use the Como trip planner. Use the Route module to find suitable travel options from Argegno to Como. In July in Como, expect temperatures between 34°C during the day and 21°C at night. Wrap up your sightseeing on the 13th (Fri) early enough to travel back home.